Look at these Pelican Parcels Gift Hamper treats – they are so cool! If you are looking for bright, fun and awesome gift ideas for your friends, family or work colleagues, Pelican Parcels Gift Hamper have it all. These guys have a selection of hampers to choose from and they post to anywhere in the UK. Their premium, funky designed boxes are lined with black tissue paper and sealed with a sticker too. Because of this, these hampers have a real touch of luxury. Included in their offering is an American Candy Gift Box, Luxury Tea Selection Box, A Vegan Snack Treat Box, Hershey’s American Chocolate Box and a Coffee Gift Box with… Two Chimps Coffee – wahoo! Inside the coffee gift hamper you will find chocolate covered coffee beans, “Cappuccino Thin’s”, Stroopwafels and three coffees. The coffees are freshly roasted and ground at our roastery in Rutland. As mentioned, the team at Pelican Parcels have picked three speciality coffees from us. A morning cafetiere coffee from Africa is first. It’s bright and fruity flavours are perfect to start your day right. The second coffee they have chosen is an all-day – easy drinking coffee from Central America. This has a biscuit sweetness and a rich, creamy body, Mmmmm. And last but not least, they have included a decaffeinated coffee as an evening treat. All of the coffees included in the Pelican Parcels Gift Hamper are ethically sourced, freshly roasted in small batches and placed in small, 50g taster bags – perfect for a couple of cups! Included on the labels are brewing tips and tricks to help you on your way too. So, if you are looking for a gift for someone who loves their coffee, you can treat them to a Pelican Parcels Coffee Gift Hamper. 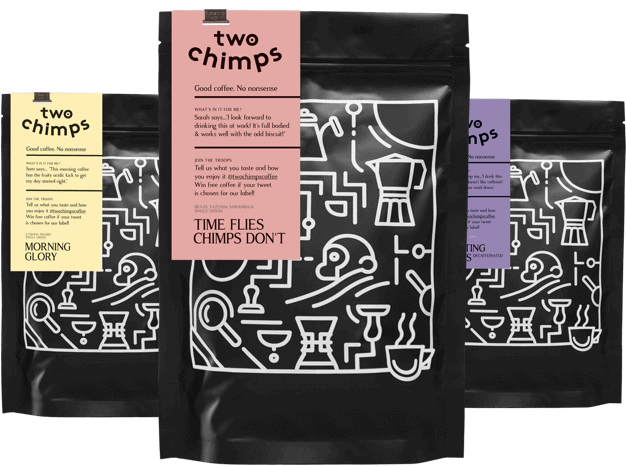 In addition, are you looking for somewhere to try Two Chimps Coffee?